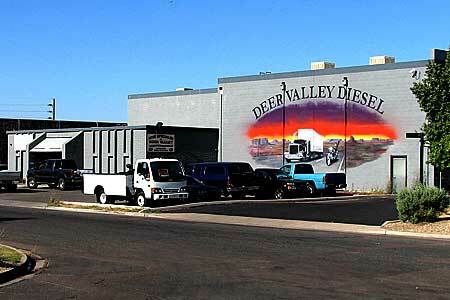 Deer Valley Diesel Repair, Arizona's Emergency Road Service Specialist's, 24/7/365 Days a Year. Se habla espa�ol en Deer Valley Diesel Repair. The Flash plugin, V.10 or newer is recommended but not required to view this site. If you need the Flash plugin click the Flash logo below to download, and install. Macromedia download area will load in a different window. Please be patient if you have a slow connection speed. This site best viewed at 1024 resolution. Award winning Deer Valley Diesel is Arizona's Emergency Road Service Specialist's. Deer Valley Diesel Repair is your 24 hour emergency road service specialist, the only diesel truck service and repair shop you will ever need. We specialize in all truck repair's, be it class 8, heavy duty, medium, or small pickups. Our qualified techs can also fix your buses, recreation vehicle's, and heavy equipment. We can perform all major oand minor repairs on the engine, transmission, suspension, front and rear differentials, drive line, tires, brake system, fuel injection system, lift gate, air conditioning - A/C System, hydraulic, electrical, frame, body and paint. We provide servicing and maintenance for all fleets, call us for details. Deer Valley Diesel's emergency roadside assistance on class 8 trucks is what we broke into the industry with in 1994. Whether it is brakes, lights, a starter, or flat tire, you're only one call away from hitting the road again. If it's a major break down, we will get you a tow to our full service 6 bay repair facility, complete with two Atlas 15,000 lb. lifts where we can solve any problem you have. For more details on the services we provide please visit our services section inside. It's 3:00 a.m. Christmas eve. You're 3 hours away from home and the truck dies. You're only one call away from hitting the road again. Look for our mural off of N.14th Ave. and W. Melinda Lane. Click the image above to see more shots of our shop. Visit our Facebook Page, (link below). Tags: Roadside Assistance, Mobile Truck Repair, Diesel Repair, Truck Repair, Trailer Repair, Bus Repair, RV Repair.